BBC NEWS | UK | Education | Q&A: What are grammar schools? Q&A: What are grammar schools? The Conservatives are abandoning their support for grammar schools, saying academic selection is unfair to poorer families and limits social mobility. Education spokesman David Willetts said his party wanted to back the new city academies in England. Grammar schools are state schools which select their pupils on the basis of academic ability. Pupils in their final year of primary school sit an exam known as the 11-plus which determines whether or not they get a place. There is no central 11-plus exam, with papers being set on a local basis. Much the same as other maintained schools. Central government allocates funds, largely on a per pupil basis, to local authorities. A local funding formula then determines how much each school receives. How many grammar schools are there and where are they? There are 164 grammar schools in England. Ten local education authorities, for example Kent and Buckinghamshire, have more than 25% of their pupils in grammar schools and are considered to be fully selective. 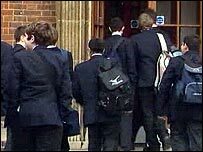 Other areas, like Greater London, have grammar schools in "pockets". Northern Ireland currently operates a selective system, but the 11-plus transfer test will be sat for the last time in autumn 2008 for entry in 2009. It is yet to be decided by the Northern Ireland Assembly what will happen thereafter. There are no grammar schools in Wales and Scotland. Why is there renewed controversy over grammar schools? Critics of the system say these schools have been "hijacked" by the middle classes. Many parents have their children privately and intensively coached for the 11-plus exam, often from the age of eight or younger. Anecdotally, there is evidence that some parents put their children into a private primary school to increase their chances of performing well in the 11-plus exam. With the bar so high, critics say the system disadvantages children from less affluent or ambitious homes. Research suggests children from poor homes who get in to grammar schools flourish there. The problem is, relatively few get in. There are also concerns for late developers: opponents of the system say it "writes off" children who do not get a grammar school place at a very tender age and brands the majority, who do not "pass" the 11-plus, as failures. What do grammar school supporters say about that? That only the opponents of selection use the disparaging term "failures". Children develop at different rates and therefore need different educational opportunities. There is selection everywhere: popular comprehensives choose on the basis of nearness to the school - which can mean ability to pay high house prices, so able children from poorer backgrounds lose out. The Tories now want to back academies over grammar schools. Why? City academies - now just called academies - are one of Tony Blair's flagship policies and are designed to raise standards in less advantaged communities. They serve very different social groups to grammar schools. By backing academies over grammars, the Tories are moving away from supporting a system that is dominated by the middle classes to one which targets more vulnerable social groups. Academies are publicly-funded independent schools. They are set up in disadvantaged areas, either as new schools or to replace existing schools. They have more freedom than other schools in the maintained sector over issues such as teaching, the curriculum and how the school is governed. Academies are established by sponsors from business, faith and voluntary groups which put up to £2m towards the cost of the new building; the rest of the money is put up by the government. There are currently 17 academies open in England and the government wants to see 200 by 2010, including 60 in London, with an undated target of 400 in all. Could grammar schools cease to exist? In theory yes, although this is unlikely to due to the popularity of the grammar system among many parents. Selection on the basis of the 11-plus only ceases where there is a local demand for this. Current legislation allows parents to make decisions about the future of selective admissions at existing grammar schools by means of petitions and ballots. A ballot like this was held in Ripon, North Yorkshire, in 2000, where a group of parents sought to turn Ripon Grammar School into a comprehensive. They failed. Additionally, the governing body of a grammar school may publish proposals to end selection at the school. What is the Labour government's stance on grammars? The current policy on grammar schools was agreed by the Labour Party Conference in 1995. It states that there will be no new grammar schools and no further selection based on the 11-plus. What are the other parties' views? Traditionally, the Conservatives have supported the grammar system. Now the party says the system benefits the middle classes and that academies are the way forward. However, they do not plan to scrap existing grammar schools. The Liberal Democrats would not shut down grammar schools either, but would not open any more. The Lib Dems had hoped to change the rules on ballots over whether or not to keep a grammar school open, saying the current system favours those who prefer grammars, but the Conservatives opposed the plans.